Today was a day for the Cassel Kids to enjoy the Ghost Town of Leetonia. I found them huddled around the wood-burning stove enjoying roasting chestnuts in a variety of ways some more promising looking then others. The blackchestnut dug out of the coals looked beyond hope. It was great to see kids enjoying something other than video games and watching the next generation forming fond memories in Leetonia. The kids names are Front: Avery; Middle row: Elliot and Colton; and back row Lee Cassel. Craig Cassel shared his 1999 master thesis paper with me he did on Leetonia and the Pennsylvania lumbering industry and it is very good. I am copying it and hope to share some of it with you at a later date along with some interviews of some still living residents of Leetonia. There are not many left to tell their tales and I hope we can record as much as possible. 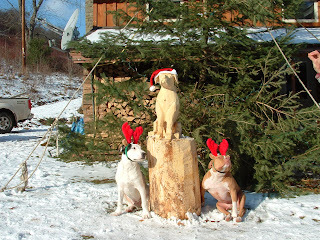 From the Cassel kids to the Mountain Girl, Paula, logging out and smelling the roasting chestnuts! I took this video on Christmas Day around the Petite Camp. The icy crust on the snow made walking difficult and a little shaky video. Enjoy the sites and sounds of Leetonia on Christmas Day. Mountain Girl, Paula, logging out! The plowed road from the Galeton side of Leetonia Rd is a real blessing. There is nothing like being able to hop in your car and go somewhere without chains or a snowmobile relay. Leetonia Rd from Leetonia down to 414 is questionable in spots. It may break up a little today, but my suggestion is to have a pair of chains in your vehicle if you want to come up that way just as a precaution. 4-wheel drive and good tire are definately on your side. Many people are coming into Leetonia this weekend for the holiday...so be safe on these roads so your celebration is made of all happy memories. Mountain girl, Paula, Logging off. Here are more camps on the edge of Leetonia going out of town towards Cedar Mt. Mick's place is first and the little place next to his and across the road Theresa's camp(The old Sammy Lawerence place). Enjoy the Holiday cheer and be glad you don't have to deal with the Icy snow here it is difficult to walk on without falling. Snowmobiling is out of the question until we get new snow. Mountain girl, Paula, logging out! P.S. I have one more video I will upload tomorrow that I took on Christmas day in Leetonia. Here are more camps and the old CCC building. One more upload and I will have everyone in Downtown Leetonia. This pictures are taken in order going down the road from the South edge of Leetonia heading towards Painter Leetonia Rd. I can only load a few cabins at a time so you all are going to have to look at several posts to find yours. It was too icy to go outside of the main area of Leetonia Christmas Day. Sorry to those of you whose places are farther out. 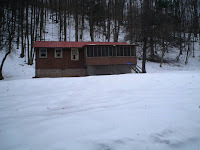 For all of you who have cabins on the side of the hill in Leetonia. This is what your place looked like on Christmas Day. The only thing in Leetonia other than the ghosts of Christmas past where a flock of Turkeys and one deer. You know you live in the middle of hunting country when you see this kind of Christmas lighting display. I just couldn't resist sharing it with you even though it doesn't have much to do with Leetonia. Mountain Girl, Paula, logging out! The following is a reprint of the story which involves the cutting of our first Christmas Tree here 5 years ago. As a carpenter I pride myself in estimating the size of things fairly well. Pride often comes before a fall and my fall was coming. During some trail clearing last summer, I noticed a nice twenty-foot spruce tree growing in the middle of the trail. Rather than cut it out and let it die I decided to leave it until winter and use it as a Christmas tree in front of the cabin. I envisioned how beautiful the tree would be all decorated in front of the cabin to celebrate our first Christmas and I could hardly wait. We moved up to the cabin in September. I’d spent two months cutting firewood to heat our house, winterizing the plumbing, insulating, and replacing the leaking roof on the house. December rolled around fast and I remembered my plan for the tree. We’d already had a couple of inches of snow so we could drag the tree up without getting it muddy. The tree wasn’t in an easy place to get to. A large valley lay between the access road and the trail the tree grew on. My plan: cut it; let it fall into the valley then pull it up the other side with ropes attached to car. I started the chain saw and removed the lower branches of the tree so I could reach the trunk of the tree. Hmmm, this tree looks a little larger around than I thought. I cut a wedge out then cut from the opposite side to fell the tree into the valley. The tree cracked and fell. It went from the trail all the way to the bottom of the valley. The twenty foot high tree was at least fifty foot. Branches held the trunk of the tree ten foot in the air and I couldn’t reach it to cut the tree smaller. Time for reinforcements, I returned to the cabin and loaded the Subaru up with ropes and Lee Anne to help me. I started the chain saw and trimmed the tree back ten feet. “That should do it.” I proclaimed and we stretched the ropes up to the car. I crawled under the car and looked for something to hook the rope to. I wrapped the rope around the back axel. Poor car, I thought, its engineers couldn’t imagine it pulling a large tree up a hill. Lee started the car and moved down the road. As soon as the rope tightened the car tires spun and started to slide. “Darn, still too much tree.” I said to myself. “It’s too heavy.” Lee shouted back to me from the car. I marched back down the ravine and restarted the chain saw. I cut another ten feet off the tree and we dragged the branches away. Lee tried again and the tree started up the hill. I’d wrapped the rope around an old stump so the tree would go up the hill, instead of following the car down the road. Slowly the tree rose up the hill. As the tree approached the end of the climb, I waved to Lee to stop. I detached the rope and Lee went down the road to turn the car around and head back. She pulled the tree toward the cabin and I pulled sideways on the rope to help roll the tree up to the road. Once on the road the Subaru easily pulled our prize to the house. “The neighbors are going to think we are nuts.” Lee said eyeing the large tree. By neighbors I knew she meant our resident mountain man. He never did anything that wasn’t practical. He would wonder what those silly girls were up to now. It would be dark in a couple hours so we decided to wait until the next day to raise our tree to its upright position. Morning came with the anticipation of getting the tree up. Okay, I thought, if I get two ropes on the top and we stay almost opposite each other we should be able to pull it up. Ropes attached. “Pull!” I yelled. For all our effort and strength the top of the tree bent only slightly. When at first you don’t succeed you get the Subaru. One major problem, the only place to put the Subaru was on ground about six feet downhill from the base of the tree, hardly a spot to get an upward lift. I didn’t have anywhere to run a rope up to get vertical lift. I decided on anchoring the bottom of the tree to the porch and the top to the porch with enough slack it could go up but not swing out. The last rope ran from the top of the tree to the waiting Subaru. I gave Lee the signal to move forward slowly and prayed the porch wouldn’t pull off. The rope tightened and the tree started to move. Snap! The rope to the porch broke and the tree swung facing the wrong way. I gave a grunt of disappointment. The blame thing is too heavy. I thought to myself. “You going to have to cut more off.” Lee shouted affirming my thoughts. She walked up and we both stood for a while at our problem trying to think of an answer. Afraid of wrecking the porch with the car, I decided the tree must shrink until we can pull it up ourselves. I cut another five feet off. Every foot I cut from the tree took a little of my pride with it. We tried to lift it again. “Still too heavy.” I shouted in frustration. “You’re going to have to cut more off.” Lee said not hearing me. “I am really going to be pissed if we end up with a eight foot high tree by the time we can lift it.” I complained to Lee. The chainsaw chunked off another five foot. We pulled again. This time the tree started to go up. “I think we can get this up now.” I said elated. “Lets put the lights and star on the top before we lift it.” I suggested. “We can’t reach the top once its up.” Through a combination of pulling and pushing we got the tree up on a board between two ladders so we could wrap lights around the top and I wired the star to the top. Lee pushed against the top of the tree with her shoulders, leaving her with some nice bruises. I pulled it up with the rope. When it started to reach vertical she grabbed the rope and tried to stabilize the tree. Too late it fell to the ground. Tired we groaned and pull the tree into position again this time we got it tied off before it returned to earth. I ran two ropes to the porch and one to a stake in the ground. I decided to add three eight foot two by sixes nailed up about five foot on the trunk and angled down like a tripod as added support. Confident in my two by six tripod and ropes would hold the tree in a wind. I stood back to look at the tree. The glorious spruce had suffered much abuse on its journey to our lawn. Cutting nearly thirty feet off the fullest part of the tree, the scraggly top looked like a large version of a Charlie Brown tree. My tripod of two by sixes stuck out like a sore thumb. I looked at the large pile of limbs I’d cut off and started to weave them into the sickly looking tree. I covered the tripod and filled out the bare spots. “Not bad.” I said to myself. Lee and I finished stringing the lights around the tree and we waited for dark. Without streetlights and other houses in competition we lit up the forest. All the tree’s imperfections disappeared in the dark. Animals watched the bright tree and wondered about their strange human neighbors. I looked out my second story bedroom window and saw the star of the tree even with my eyes. It’s a Christmas miracles, I thought, for even after cutting thirty feet off my twenty-foot tree it still stood twenty feet high. For any of you planning a trip to Leetonia this weekend, you should be aware that the road coming up from Cedar run has a couple of snow slide areas that are narrowing the road. Two posts ago I put a video up showing the roads this was before 8 more inches of snow and the slides....so if that looks scary don't drive up. These spots are not unpassable by a good 4-wheel drive vehicle, but extreme caution should be used. You must be confident of your abilities and be sober to make it. From the Gaines direction the road is plowed to Leetonia. It is looking like rain on Sunday, which will make the roads which are unplowed a mess and if it freezes the plowed roads slippery. Mountain Girl Road caution is in effect and I would rate the road from Cedar Run to Leetonia about a 6 on a scale of 1-10 in difficulty. Weather will be above normal temps so it should be nice to sit by the fire. The Mountain girls just returned from a winter party and everyone made gifts to exchange. Conversation was the medium of exchange of greatest value. In this time of consumer driven expensive gifts it is nice to see so much joy in just spending time together and talking. If you only take one thing home from Leetonia this season talk the gift of true conversation and sharing to your holiday celebration and you will be blessed from the experience. Stanley Dudkin from Cedar Run Inn gave me this for Christmas. Not many people would be excited about recieving such an object, but I knew a little something perhaps you do not. This object comes from the days of the CCC camps here in Leetonia. Although, I can't be sure this was used in Leetonia there were certainly ones just like it being used. Do you know what it is? I will tell you what it is not. It is not a shingle spliter, or a cheese slicer. It would make a horrible torture device. Ah but, at last, it is a brush clearer, mostly for overhead small limbs on trails. During the days on non-electric and few gas-powered trimmers this was the tool of the trade. The blades I understand are still available and able to be sharpened over and over. Stanley picked this up from an Amish man who sells a lot of these old tools. It is quite heavy about 30" long and when you pick it up you have a real desire to take a whack at something. Not a good Christmas present for children. I am not going to leave this hanging on the wall somewhere. It is definately going to come into use clearing some trails in Leetonia again. Thanks to Stanley for the great gift. I am sure some of you are wondering what it is like to drive the roads of Leetonia in the winter. I did this video a couple days ago before we got 6 more inches of snow just to get you warmed up to the idea of driving. 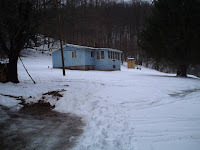 This was taken on Leetonia Road coming up from Cedar Run just before the Cedar Crest Cabin in that nice narrow area. I was driving without chains so this wasn't a particularly hard to drive or really scary day. I am not sure either of us is steady enough to get video and drive on one of the hard to travel days. Enjoy and be glad you live close to a paved, plowed road. Mountain Girl, Paula, logging out! The SlateRun general store has a wonderful little Christmas Window I wish I could have taken a picture showing the whole thing but the glare on the window made it so I had to be close for a picture. 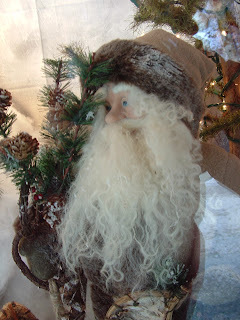 The Santa looks like half the mountain men up here showing off their white beards. 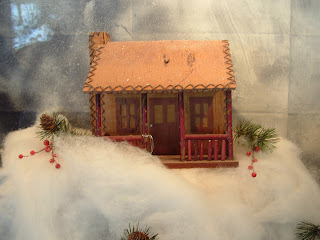 There is a cute cabin as well and many neat things in the store. Not many people were up yesterday and we had a nice chat with Tom and Deb Finkbinder the owners of the store. There is something special about the quiet slow nature of things this time of year that many of the locals look forward to. 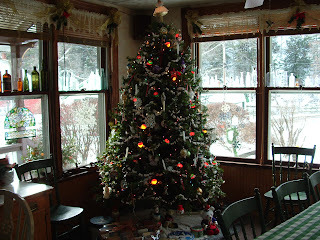 I also took a great picture of Charlotte Dudkins tree at Cedar Run Inn. She does most of her decorating on Thanksgiving weekend and warns visitors not to eat the candy canes on the tree. She says they are at least four years old and probably wouldn't taste too good. She strings popcorn and cranberries as well, but says the cranberries look more like raisins when they dry out. Stanley was out working on the plow, which he says always runs in July and decides to come to a halt at the first snowflake. We are getting snow today with a combination sleet snow as of 2:30pm we had about 4 inches not near the storm they predicted. Of course locally it is considered a no storm the more it is talked about. It is the ones you don't hear much about that catch you waist deep in the white stuff. Have a wonderful Leetonia day. Mountain girl, Paula, logging off. It looks like we are going to get more snow added to our already 8 inches on the ground. It may turn into a snowmobile only day by tommorrow. I will keep you updated. I am planning on going to Slate Run and Cedar Run today before it hits and will get some pictures of the valley Christmas decorations. Although not many people are up here this time of year the ones who are here get in the holiday spirit. Lee took a tumble on the ice yesterday and managed to really twist up her wrist. Since she thought she might have broke it so we had the one and a half hour trip to the hospital followed by the three hour wait to get a diagnosis. It is badly swollen but not broken. You find out how much you use part of your body to do things once you hurt it. I will post more later for now Mountain Girl, Paula, logging out. I don't know how many years it has been since the roads to Leetonia have been plowed. I know they were plowed in the 60's but I don't have the last date. Regardless, this is the first year they have plowed us out. They are plowing Leetonia road only from the Galeton side to downtown Leetonia and back no other side roads are being plowed so if you have a camp up here and want to use the plowed road to get to it you will have to come in from that side. the plowed road and it disrupts the snowmobile traffic. After 5 winters of snowmobling out and having limited ability to work. I decided to request the plowing. For those of you this inconveniences I am sorry, but I could no longer afford the luxury of not working in the winter months. If anyone would like the roads not to be plowed and would like to pay me a salary for not working. I would be more than happy to return them to their natural state. flakes you can actually see them in the last picture taken from the top of the hill. The mountains are dressed up in formal white today and it is great to be living in Leetonia. By the way this is my 100th POST! of Lost in Leetonia. I love doing it and can't believe I have posted that many times since March. Hope you all enjoy it as well. It is officially winter in Leetonia we are getting a major snowstorm today with the mountain already showing 8" and more is to come. So far no sign of the promised snowplow as of noon. I think they are waiting for the snow to be done. I am going to start up the snowmobile and get my cross-country ski trail packed down. Today is a good day to enjoy the snow and the warm fire. Run and it looks like it wasn't a minute too soon. I have enough inside cabin work for the next couple months, but I have the time to enjoy a little hard-earned time off and what better excuse than a snowstorm. Temps are still moderate at 21 degrees so it is perfect weather for a little winter sports. I am sure the snowmobilers won't be far behind this storm to ruin the quiet, but I am enjoying the sound of absolutely nothing for today. 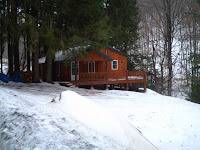 Snowed in Leetonia, Mountain girl, Paula logging out! Every year I take a picture for my Christmas Card. This year I carved a stand-in for Jack and it was the only one of the dogs who behaved. Leo always hates this and the puppy just wanted to eat the ears. Leo looks like we are killing him in this picture and he literally had to be dragged to the spot. Sometimes I wonder why I put myself through this every year. Hopefully next year the puppy will be better behaved. I have no hope for Leo. There is a short clip of me trying to get the ears on Scooter. Freezing rain tonight...Not a good time to drive to Leetonia. Here are a couple more pictures of the damage at Buckhorn. The first is the inside wall near the stove pipe. Today I took some video at the Buckhorn Camp and got everyones name that was in the camp during the fire. This is Sheila explaining what happened only a few hours after they arrived at camp. Robert Staller Sr. and Jr. are also in the shot. Adam, Matt and Ozzy were there as well but do not appear on this video. I hope Sheila forgives me for making her a star. Mountain Girl, Paula , Logging out! When someone knocks at my door at 1 am and asks for a fire extinguisher its never a good sign. A fire up here usually means a total loss of building, life or both. But this story has a happy ending. The smoke detector failed but not the noses of the camp members who were just getting ready to go to sleep. 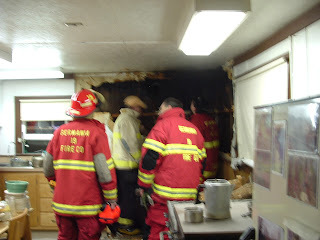 The wood stove pipe overheated and caught the wall on fire. All of the walls up here are double thick solid hemlock and once fire gets started between the boards it can be a difficult thing to stop. mostly on the fire, Sheila in the excitement of the moment tossed a bucket of water right into Robert Senior's face. They still managed to get enough of the water on the fire to keep the cabin from burning down until the fire company came as backup. The Germania fire company came within 40 minutes of my 911 call, which isn't bad on these slippery roads. The smaller brush truck was all that could drive back the 1/2 mile lane to the camp and it was indeed fortunate that not much was needed. After careful inspection and the adding of more water the wall was deemed safe enough to leave. no one was hurt not even their new puppy, part Rottweiller and part Bermese Mountain dog who at eight weeks looks like a small bear. They all smell like smoke and probably won't sleep the rest of the night. But this is the kind of stuff you tell your grandkids. Because you lived through it. This is one lucky camp. Sorry the pictures are so blurry.. guess my hand isn't too steady at 2 am. Mountain Girl, Paula, logging out and hitting the pillow. I will post more tomorrow when I am awake. For those of you who haven't been up in the last month, I have taken a couple pictures of the latest change to Leetonia. A trailer has been moved into the site of the old store, which was torn down about two years ago. It is unfortunate to loose such a landmark and have it replaced by a trailer, but with lack of any ordinances against trailers and one across the street it is difficult to stop. Although, I have nothing against people wanting to come to Leetonia it is a shame to put something like this in such a prominent spot in town. The Petite camp is the most affected with a large mound of dirt not more than a hundred feet from the front of their cabin. Their only saving grace is the row of pines which somewhat block the view. As you can see it snowed again and is snowing today. The wind has been very high in the last couple days and we lost power yesterday morning, however it was restored fairly promptly. Today promises more wind and snow it won't be a fun day to work outside, which I must do. You all have a great Leetonia day. Mountain girl, Paula, layering up and logging off. Since Lee talked about the bottle in the video I decided to post a picture of it to see if any of you know what might have filled it. She found it back by the pond and the date on the bottom is Sept., 1931 it has a shamrock on it as you can see. Most people think it was filled with imported beer. But no one can tell us what kind. Any input would be great. Mountain Girl, Paula, logging out! I didn't think this would work its my first attempt to upload video to this site. Lee shot this during her walk with the dogs. There was a lot of wind interfering with the sound. We got about 3 inches of snow last night and they are promising more guess we won't know until morning what the damage is. If this works well it will bring a whole new dimension to the news from Leetonia. Seems most of the hunters left today and there are only a few people up here this Sunday. The cold is a bitter reminder of how much winter we have left. Officially winter doesn't even start until Dec 21st. and last a very long three months. We don't have an extremely fast internet connection so loading a lot of video probably won't happen but it is nice to see things in motion every once in a while. Mountain Girl, Paula, logging out!